Leaves: Basal, ascending, numerous, evergreen, thick, very stiff, narrowly linear, 16 to 28 inches long, 1/4 to 1/2 inch wide, glabrous, waxy; margins entire with white, thread-like curly fibers; tips spiny. Inflorescences: Racemes, elongate, 15-50-flowered, mostly above leaves. Flowers: Bell- or cup-shaped, drooping, greenish white or cream-colored, 1.5 to 3 inches wide; sepals 3 and petals 3, similar in shape and texture; stamens 6, filaments stiff. Fruits: Capsules, woody, oblong, 6-sided, 2 to 3 inches long, 1 to 2 inches in diameter; seeds numerous, flat, dark. Habitat: Dry, rocky or sandy, prairie uplands, slopes, and roadsides. 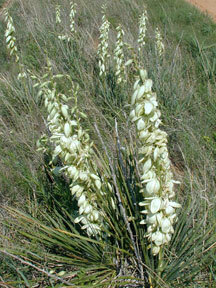 Forage Value: Cattle and deer eat the flowers and immature fruits, and bison will uproot plants and consume the roots. Uses: Native Americans used the roots in treatments of stomachaches, dandruff, head lice, and sores. Fumes from the burning roots helped subdue uncooperative horses. The flowers and fruit pods were eaten raw or cooked, and the leaf fibers were used to make cords, baskets, and sandals. Comments: Yucca roots can extend horizontally 30 feet. When soaked or rubbed in water, the roots lather and can be used as a soap substitute, giving it the common name "soapweed".